Almost Island is a space for literature that threatens, confronts, or bypasses the marketplace. The space began with an online journal, then expanded to an international writers dialogue, held every year. The seventh edition of the Almost Island Dialogues will be held at the India International Centre, New Delhi, from December 19th to 22nd, 2013. The discussions centre on issues of craft, form, and content as well as the context of writing in different cultures. Unlike a literary festival, Almost Island likes to keep the Dialogues small, rigorous, and intimate. These conversations are concerned with process, with how things are learnt, explored, created, and created again. This year we plan to continue with some singular writers. The mornings and afternoons are kept for intense, extended, freewheeling talks and discussions; the evenings, for readings and performances. The readings are open to all, but to attend the day discussions pre-registration is needed. For pre-registration and any other queries, please write to Rahul Soni at almostisland.edit@gmail.com. Download the .pdf for more information. Click the image above to access the full issue. 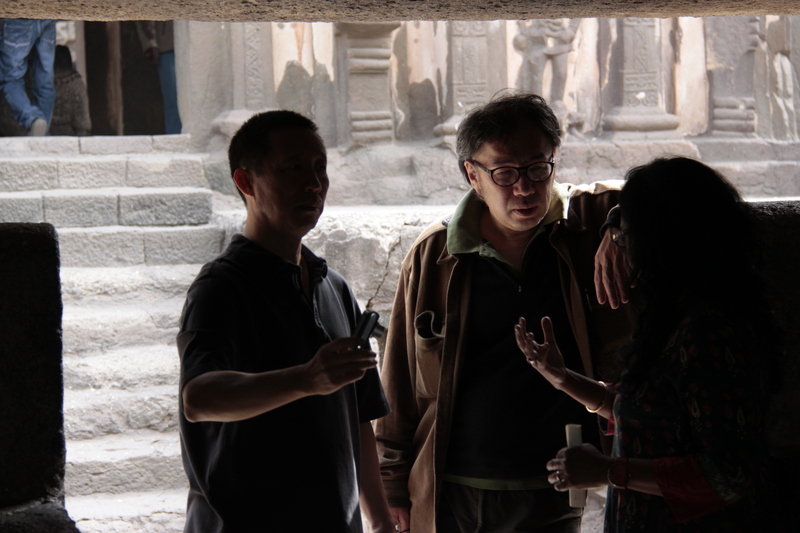 Almost Island editor Sharmistha Mohanty sent me the following pictures from the India-China Writers Dialogues. In the first is, from the top left, Xi Chuan, Li Tuo 李陀, Lydia Liu 刘禾, Zhong Yurou 钟雨柔, Kabir Mohanty, Ge Fei 格非, with Sharmistha Mohanty, Bei Dao 北岛, Ashwini Bhat, and Ouyang Jianghe 欧阳江河 in the bottom row. In the second shot, we have Xi Chuan with Ouyang Jianghe and Sharmistha Mohanty. The pictures were taken by Samimitra Das. The Winter 2012 issue of Almost Island is finally here, featuring an essay Xi Chuan wrote in English titled “Style Comes as a Reward,” his prose poem “What the Tang Did Not Have” 唐朝所沒有的 in my translation, and my translation of “The Original Way” 原道 by Tang Dynasty man of letters Han Yu 韓愈 (768 – 824), which should be provocative on its own but also provides some historical context for Xi Chuan’s prose poem. The issue also includes poetry by Amanda Berenguer translated by Kent Johnson, an essay by Ravi Shankar titled “The Geology and Physics of Style,” new poems by Stephen Burt, and more. Since the beginning of the dialogue two years ago, the participants have been the same group of writers, and Mohanty believes this has been a very important aspect. “With the same group of writers meeting each time, we have become good friends and learnt a lot from each other,” she says. Besides the speakers for the panel discussion, the participants include Allan Sealy, Rukmini Bhaya Nair, Adil Jussawalla, Vivek Narayanan and K Satchidanandan from India and Ge Fei, Xi Chuan, Zhai Yongming and Ouyang Jianghe from China. In honor of the upcoming China – India Writers Dialogues, I wanted to point out the journal Almost Island, whose editors Sharmistha Mohanty and Vivek Narayanan have been organizing the Dialogues. See also the Almost Island publication of Mohanty’s essay on her experiences in China, “Mountains and Rivers“; Xi Chuan only gets the briefest of mentions (Bei Dao 北岛, Ouyang Jianghe 欧阳江河, and Li Tuo 李陀 get fuller discussions), but it’s a grand take on one writer’s considerations of China and its contrasts with India. Also the prose poem “Editorial Sutras,” which offers Mohanty’s impressions of the first Chinese – Indian Writers’ Dialogue, in 2009. The online literature journal Almost Island, founded and edited by novelist Sharmistha Mohanty along with poet Vivek Narayanan, has begun a dialogue with mainland Chinese writers. The first such dialogue, led on the Chinese side by the great contemporary poet Bei Dao and the seminal journal Jintian (Today), was held in 2009 in New Delhi. This was possibly the first unofficial dialogue between Indian and Chinese writers in recent times. The second was held in China, in Beijing and Shanghai. This Mumbai meet is the third chapter of the dialogues. It brings together some of China’s and India’s leading writers. Ashis Nandy who has been part of these dialogues, has called it “historical”. He has said, “This is not a meeting between two countries, but an encounter between two civilisations.” The two evenings of readings will be rich with poets and novelists from both countries reading from their exceptional works.